Clermont Garden Club member, Jean Gibson (center), is pictured here with Cora Lacey and Eli Allison at the Cooper Memorial Library. 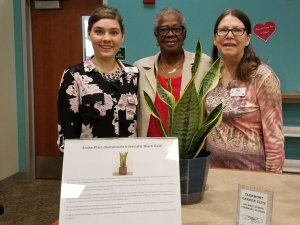 Jean brought to the library a “Sansevieria Trifasciata” also known as a “snake plant”. These plants are native to tropical West Africa and can be grown outside in warm climates, and they do well as indoor plants. This plant is tolerant of low light levels and irregular watering!